Middle States Commission on Higher Education, which accredits degree-granting colleges in the region, issues a warning when an institution is not in compliance with government policies and the university’s governing body responsibility for quality and integrity. It is requiring the university to submit a report on issues like governance and financial stability by Sept. 30. “I understand all of the facts that emerged from the Jerry Sandusky investigation and still plan to attend Penn State for its academic pedigree. That is all coming into question now because the prestigious Middle States Commission on Higher Education is threatening to pull Penn State’s accredidation. Looks like I have to attend the Wilkes-Barre Scranton campus now!” – something an 18-year old would never say. Penn State’s football program faced “unprecedented” sanctions in the form of scholarship losses and four years of bowl ineligibility while the university was fined $60 million. When you add in the civil lawsuits that are assuredly coming, the school will end up doling out hundreds of millions of dollars. Joe Paterno’s reputation, which was pristine ten months ago, is irrevocably tarnished to all but a delusional faction of cult worshippers. None of this is unjust. I’ve been as vocal a critic of the Penn State administration as anybody (see here, here, and here), but at some point people need to stop piling on and let the university put its best foot forward. Some commission that nobody has ever heard of’s pulling the university’s accredidation is a grandstanding move that does absolutely nothing for the victims. But now I guess we know the Middle States Commission for Higher Education exists. Though stiff, these penalties are warranted. In fact, that Penn State agreed in advance not to appeal implies that it worked in concert with the NCAA to self-impose them. While many people are saying that this is worse than the “death penalty,” it’s really not. It will keep Penn State out of legitimate national championship contention for six or seven years but with the fertile Pennsylvania recruiting base and the right people in charge the program could return to prominence within a decade. $60 million sounds like an outrageous amount of money but Penn State has a $1.83 billion endowment. (The impending civil suits, though, will make more than a 3% dent in that lofty figure.) So Penn State is getting stiffly–but not irrevocably–punished from all this. In taking unprecedented measures to swiftly and unilaterally impose sanctions on Penn State, the NCAA establishes the precedence for future swift and unilateral action. There are few institutions in America less deserving of the public trust to act in this manner. As we’ve seen time and again, the NCAA is a cartel whose primary purpose is to maximize personal wealth and status for its stakeholders–coaches, athletics directors, and bowl presidents to name a few. It only acts in the best interest of its student athletes and/or the overall public if its actions happen to also be in the best interest of these shareholders. The N.C.A.A. determined that a total of 30 Caltech athletes on 12 teams practiced or played in games while academically ineligible from the 2007-08 to 2010-11 academic years. But most of the infractions, which were discovered and reported by Athletic Director Betsy Mitchell in 2011, were the result of Caltech’s unusual class registration system. During the first three weeks of each trimester, students at Caltech, the academically rigorous college in Pasadena, take part in a process known as shopping, in which they are allowed to essentially sample classes before being required to register for them. Rod Kiewiet, Caltech’s dean of undergraduate students, said many students stayed in these classes for the entire term, but they, like so many college students, sometimes procrastinated. If students are not officially registered for enough classes during this three-week period, they can be considered part-time students, and part-time students are ineligible to compete in N.C.A.A. events. The Fiesta Bowl had covered $13,086 in expenses connected with one employee’s wedding in Kansas City. Junker bestowed on others such gifts as iPads, gift cards and, most bizarre, bullion. He purchased (and billed to the bowl) some $22,000 worth of gold and silver coins. 2. Jamar Samuels’s suspension led to the following headline that simply says it all: “Jamar Samuels Ruled Ineligible For Trying To Feed His Family.” His former coach, Curtis Malone, admitted after the suspension that he had given him $200 so Samuels could buy groceries for his mother. “Yeah, I did,” he said. “It’s the same way when he played [for me] on road trips. When he didn’t have money to eat, he ate.” He later told CBSSports.com, that he didn’t know that he was doing anything wrong. “If I knew it and wanted to hide it, I would have done it differently. The kid’s family doesn’t have anything and he called me for money to eat.” Neither Malone nor Samuels thought they were doing anything wrong. Malone had known Samuels’s mother for years and they live in a situation where poverty literally means not knowing how you will find food for the week. NCAA President Mark Emmert, meanwhile, was paid at a rate of almost $1.6 million per year in 2010. Perhaps the biggest lesson from the Penn State fallout is the proclivity for those with absolute power to abuse it and act with impunity and without accountability. Joe Paterno was supposed to be a benign dictator. Does anyone have such delusions about the NCAA? While the Freeh Report’s facts and conclusions have not been disputed by any credible sources (Graham Spanier and the Paterno family of course do not qualify as such), it was a private, for-profit investigation that ultimately absolved its sponsor, the Penn State Board of Trustees, of wrongdoing except for its lack of appropriate oversight. Accepting it as the gospel is not adequate due process. Why didn’t the NCAA conduct its own independent investigation after news broke in November instead of waiting for the results of one commissioned by Penn State? Are we sure that no Penn State trustees and nobody working for the NCAA had even an inkling about Jerry Sandusky, the architect of the great ‘Linebacker U’ defenses who abruptly retired at 55 and somehow never coached again anywhere else? As a University of Wisconsin alum, I would not want the fate of the Badgers to rest unequivocally in Mark Emmert’s hands. Obviously, Penn State presented an extremely unique circumstance and something had to be done quickly to allow innocent players the right to transfer and meld with their new teammates, coaches, and university. But the process should have been more inclusive and transparent because now that the NCAA has established this level of power, it will be that much harder to wrest it away when (not if) it’s wielded unjustly. Penn State administrators were more concerned with self-preservation than justice for past victims and prevention of future ones. Telling Sandusky “not to bring any Second Mile children into the football building” sends a clear signal that Curley and Schultz did not care about sexual abuse victims as long as Penn State would not be implicated in them and be held liable. Considering this callousness and utter lack of responsibility for humanity, it is not a stretch to believe that Curley, Schultz, Spanier, and Paterno chose not to go to the authorities with this matter because they did not want to incur intense scrutiny from the media and general public as to a) why Sandusky wasn’t prosecuted the first time he was investigated despite a mountain of evidence which included a tacit admission, and b) why he was still allowed unfettered access to campus facilities with young boys from his charity when he had been investigated for sexually deviant behavior in the past. Media coverage wouldn’t have been AS bad as it has been this week if in 2002 Sandusky was turned in to authorities because there would not have been such an egregious cover-up and the internet had not yet evolved into what it is today. However, it would not have been pretty for those in power at Penn State. Couple that with the fact that the Nittany Lions were not winning on the field (they had no bowl appearances from 2000-2002) and Paterno would have had an extremely difficult time keeping his job in a scandal where his long-time defensive coordinator–who had been previously accused–raped an underage boy in the football team’s locker room. Jobs would have been lost and Penn State’s pristine reputation would have been immensely and perhaps irreparably tarnished. Only now, it’s worse. The legendary Joe Paterno, 85 but recently seeming old for his age, passed away this past weekend and leaves behind a life full of accomplishment, altruism, and goodwill. His pristine reputation, earned in full public view in the past 46 years as Penn State’s head football coach, was tarnished in the wake of the Jerry Sandusky scandal, but not obliterated. The proportion of which these polar opposites will endure to form the ultimate shade of gray will depend more on individuals weighing and evaluating Paterno’s legacy than any collectively formed judgment. My opinion at the time the scandal broke has not changed: when presented with a firsthand witnessed account of Sandusky’s alleged indiscretions by graduate assistant Mike McQueary, Joe Paterno, Tim Curley, and Graham Spanier acted consciously and in self-preservation to cover up the crime, thus enabling Sandusky to continue his abhorrent behavior for another eight years. If Paterno had turned in Sandusky to the appropriate authorities–not merely his higher-ups in title but not compensation or power–in 2002, he would have been fired as Penn State football coach due to a combination of his age, the comparatively milder cover-up from 1998 when Sandusky was first investigated, and–most importantly from a career, if not humanitarian, perspective–that Penn State had been struggling on the football field and had not had a bowl appearance in the previous three years. It’s impossible to say for sure what anybody else would have done if he/she were in McQueary, Paterno, Curley, or Spanier’s shoes. I would love to believe that I would have acted with the utmost character, become a shunned whistleblower, and seen my guilty conscience bury the entire Penn State football program. But, I’m skeptical of institutions and authority figures to my own self-detriment. And I still don’t know for sure how I would have acted in any of their shoes because doing the right thing would have meant the end of my career, my professional reputation, everything I had worked for–to truly empathize with these men, my life. Decisive, morally correct action by Paterno would not only have cost him his own job–his life–but would also have been a black eye on his beloved Penn State, a blemish so severe and inextricably linked to his life’s purpose that it could very well have deluded him into believing that he was acting selflessly and for the greater good. Before starting this, I first want to express the most remorse humanly possible for the innocent victims who were sexually abused by Jerry Sandusky. Our nation was founded upon protecting natural rights and what could very well end up being over 100 children had those rights grossly and preventably violated. I cannot even fathom the physical and emotional damage that was inflicted upon these defenseless victims, both at the time of their sexual abuses and from the trauma that endured thereafter. Read Rick Reilly’s excellent piece on what people who are sexually abused go through afterwards. That Jerry Sandusky was able to continue this reprehensible behavior after being investigated in 1998 and witnessed in 2000 and 2002 should haunt the consciousness and dreams of anyone who had the power to stop it and chose not to. I avoided writing about this all week because I didn’t think that there was anything particularly unique or insightful that I could add to everything that I was reading. To me, this seemed extremely black and white and I did not understand how Joe Paterno or Graham Spanier kept their jobs past Monday, let alone that there should be a debate about whether they should be able to continue to. In 2002, Joe Paterno, Gary Schultz, Tim Curley, and Graham Spanier consciously neglected to report sexual abuse of a child knowing that the alleged suspect had been previously investigated for similar behavior in 1998. It is impossible to read the Grand Jury report and consider contextual information and not conclude that this was calculatedly done out of self-preservation. This selfish cover-up enabled Jerry Sandusky to continue to freely and habitually prey on victims for an additional nine years. What follows is going to be extremely graphic but is necessary to show that the only rational conclusion from the grand jury report is that no matter how much good for how long Joe Paterno did for Penn State University, the only rational decision given what we know and can logically infer from it is that Joe Paterno HAD to be fired for his inactions. My thoughts and opinions are not entirely original. I have been educated and influenced by everything I have read on various web sites as well as Twitter, especially Dan Wetzel, SportsbyBrooks, Bomani Jones, Pete Thamel, Mark Madden, The Big Lead, Ty Duffy, Jason Whitlock, and Pat Forde. Initially accused in 1998. Retires in 1999. Never coaches college football again. Sandusky was very successful at what he did. The architect of Linebacker U. Helped win national championships in 1982 and 1986. Recognized as college football’s top assistant in 1986 and 1999. But there’s no shortage of stories and rumors about Penn State football sweeping problems under the rug, is there? Why did college football let an accomplished coach like Sandusky walk away at 55? Why did he disappear into relative anonymity? 1. Joe Paterno HAD to have known about Jerry Sandusky’s 1998 investigation. There is just absolutely no chance that Gary Schultz, VP for Finance and Business, was aware of an investigation involving the football team’s defensive coordinator but Joe Paterno was not. Zero. As the most important figure on Penn State’s campus, it is impossible to believe he didn’t know about this investigation, involving his long-time assistant, having been carried out by campus police. Many have defended Paterno, saying that they would not want to believe such egregious accusations about a trusted former assistant, player, and friend that they had known and mentored for over 30 years. It is understandable that the first alleged offense–considering that Sandusky was, for whatever reason, not prosecuted (it would not be overly paranoid to suggest that this might have been intentionally covered up the first time but with the prosecutor’s mysterious disappearance in 2005 there is just no way to know for sure why the investigation stopped)–did not cause Paterno and Penn State to fully sever ties with his legendary assistant (Sandusky remained a professor emeritus which “allowed him access to all recreational facilities” amongst other privileges). That being said, at the time of the 2002 allegations by McQueary, this was now a demonstrated pattern of unspeakably horrific behavior. As noted by Madden above, shortly after the first time he was accused, Sandusky “left” his position as a highly effective assistant at the age of 55. Whether he was pushed out or actually did retire on his own volition, to not vigorously pursue justice when confronted with such terrifying firsthand evidence for a second time in four years is morally reprehensible and completely unjustifiable. 2. Penn State administrators were more concerned with self-preservation than justice for past victims and prevention of future ones. It is simply impossible to read the grand jury report, combine it with contextual circumstances, and rationally conclude that this was an honest mistake and not a calculated cover-up. Because Jerry Sandusky was allowed to remain a free man for nine more years, more boys were sexually abused. Having felt that this is so cut and dry (apparently not everyone else has read ~100,000 words about Penn State this week and spent a majority of their consciousness thinking about it), it has been absolutely surreal to take in the coverage of these events this week. There was Graham Spanier’s saying that his support of Curley and Schultz, who are charged with perjury from their grand jury testimony in addition to their admitted negligence, was unconditional. There was the idea that in notifying athletic director Tim Curley–a former player of Paterno’s who he handpicked for the position–of what McQueary saw fulfilled any obligation other than a legal technicality to inform a “higher-up”. There were Paterno’s bizarre statement about finishing the season and brief appearances where he neglected to demonstrate awareness of the gravity of the situation or sincere remorse and accountability for his role in it. Perhaps the most bizarre has been the unconditional support for Paterno that has erupted amongst his ardent fans. Students are rioting in the streets in protest; ESPN keeps running the same clip of a loud–but wrong–Paterno apologist which we are led to believe is a representative sample of the campus. The local media did everything but bring pitchforks to the press conference where Paterno was fired by the Board of Trustees earlier this evening. My friends who went to Penn State universally do not believe that Paterno should have been fired. I have known all three of them since I was 12 (more than half of my life) and they are rational, thoughtful people. To them, Paterno represented the ultimate source of honor, integrity, and success and was far and away the foremost symbol of pride in the institution of which they were educated at and whose football team they root for on Saturdays (the magnitude of the latter cannot be overstated). He was the sole reason that one of them went to Penn State and had dreamed of doing so since he could remember. Paterno was such a godlike–but also deeply personal–role model for them that this scandal feels as if it is happening to their third grandfather. 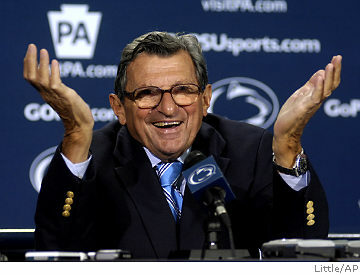 It is simply unfathomable to them that Paterno acted in conscious self-preservation and did not make an honest mistake. Even if he DID make an honest mistake–which I clearly find very difficult to believe–people lose their jobs for much less serious errors in judgment. I honestly cannot fathom how a similar situation would affect me if it occurred with one of my sports heroes–Aaron Rodgers, Ted Thompson, and Mike McCarthy come to mind. Even then, there is no single figure in sports who is comparable to Joe Paterno and the positive effect he had for so long on his institution and community. Coach K is the only person who comes close but even then he is a divisive figure in his own community where at least half of the residents root for North Carolina and loathe Duke. Moreover, he sustained Duke’s previously achieved success whereas Paterno built the Penn State program with his bare hands. For 50 years, as almost every other major college football program reeked of scandal and foulplay, Penn State won national championships and was almost entirely blemish-free. He has the most wins of any NCAA football coach all-time and has given back to the community generously and conspicuously. As Weinreb alludes to, we are more emotionally entangled with our sports teams and figures than we can possibly quantify or realize. An irrationally high proportion of our self esteem is inextricably linked to their successes and failures. No singular person had engendered as great a sense of pride for as long a time as JoePa did at Penn State. If anyone had earned the right to go out on his own terms, surely it was he. And he was. He proved it when he refused to step down in 2004 and continued coaching through until he was 84. But not in the wake of this. Short of murder, there is nothing worse that he could have covered up and enabled to perpetuate. There aren’t very many but some things are more important than football. Since he steadfastly refused to step down with as much dignity as he could have preserved in this scandal’s wake, he left the Penn State Board of Trustees no choice but to fire him. He had to go. Before Saturday when #12 Penn State hosts #19 Nebraska in a game with tremendous BCS implications which would have re-defined the words media circus if he had sat there looking confused and blissfully ignorant in the press box as the cameras focused on him incessantly and attention was detracted from the players who have earned the right to have the national spotlight in this game. It is extremely sad that Joe Paterno’s legacy will always carry the weight of this scandal when as recently as a week ago it would have been universally remembered as everything that is right about sports and humanity. Paterno is not a victim, though. The children who were sexually abused by Jerry Sandusky are victims and who knows how many more of them are out there now because of Paterno’s and the Penn State administration’s selfish and unjustifiable inaction.